1. Grand Turk cruise port is a destination itself, especially since the arrival of the Grand Turk Flow Rider. Located right as you exit your ship, this man-made experience allows you to surf, body board or kneeboard on a cushioned surface complete with water flow. 2. Aqua Boat Safaris allow you to propel your own personal watercraft. Go snorkeling, head to Sandy Beach, swim, and check out the 150 year old lighthouse before heading back to the dock. 3. For fun on land, check out the Dune Buggy Safari. Here you drive your own dune buggy (instructions and all equipment is included) past salinas, Cockburn Town, North Wells and other points of interest. Keep an eye out for the endangered pink flamingoes as you make you way around. 4. Gibb’s Cay. Home to a beautiful coral reef, numerous colourful fish and stingrays that you can feed and swim with, all in the serene and peaceful surroundings, a perfect addition to your cruises to Turks and Caicos. 5. Grand Turk Excursions also offer a horseback ride and swim package. Take a ride on your horse along the beach, then de-saddle and ‘swim’ with the horse as you go into the ocean. A perfect combination of land and sea fun. 6. Snorkeling is big on Grand Turk, but this is an excursion with a twist. Power snorkeling lets you hold a hand held power unit that propels you through the water, letting you relax, enjoy the ride and check out all the amazing sights. See coral reefs, colourful fish and more in the best snorkeling spot on the island. 7. Captain Explorer is a newer Grand Turk excursion that takes you on a fast-flying adventure on the water. You go in a 38’ hard bottomed inflatable boat to Hidden Bay where there are beautiful snorkeling opportunities. Then you hike to see the ruins and natural pools on the island before heading back to the boat for the return trip to the dock. 8. If you prefer a historical tour, how about the Historic Homes, Town and Museum excursion? Here you tour places of interest and historical importance, like the Turks and Caicos Museum, Victoria Library, Front Street and Duke Street. After the tour is free time to shop or take a walk around. 9. Kayak tours take you on a trip around North Creek in clear bottomed boats so you can see the wildlife on shore and underneath you. The gentle and calm waters allow you to sightsee as you go along, and your guide will point out interesting plant life and animals and give information on the surroundings. Also included in this tour is a beach stop for snorkeling and a guided tour of a coral reef. 10. Catamaran tours make exciting Grand Turk excursions. Sail on a catamaran to a deserted beach with snorkel stops along the way. No Eastern Caribbean cruise is complete without a stop in the gorgeous Turks and Caicos. With so many coral reefs and marine life it is no wonder there are so many tours that include snorkeling, so come and have some fun in the water that makes this destination something to see. 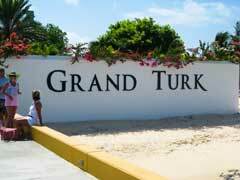 Whether you are on cruises from Miami, or other destinations, make sure that the itinerary includes Grand Turk.